Sophsterlicious • UK Blog: Hair: Operation Ombre with Scott Cornwall. I had been toying with the idea of ombre-ing my hair for months, I loved how it looked on others and I wanted in on the action.. But I was scared, I have spent quite a few years getting my hair back to my natural colour and it hadn't seen a hairdye for ages. I talked myself into it by thinking how it will only be on the ends of my hair, and how I could have it cut if it turned out to be a disaster.. So I decided to just go for it. I used products from the New Scott Cornwall range which includes a Decolour Remover, a Decolour Stripper, and Shine On. They also have some restore colour products that help to tone the hair, to either give it a boost, or to use after using a Decolour product. 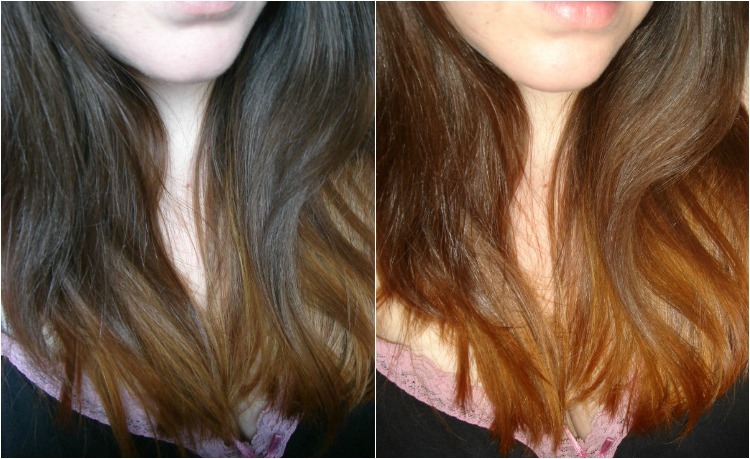 So I used the Decolour Stripper* and the Cool Ash Colour Restore* to apply when I had used the stripper to tone it down. What the strippers does it remove atrificial and natural hair pigments, leaving you with a lightened shade without bleaching and damaging your hair. This product was so simple to use, it didn't smell bad atall and it is a thick cream so didn't drip or make a mess atall. I applied this is stages to freshly washed, clarified hair. So an hour or so later after rinsing the product off I used the Ash Colour Restore product. 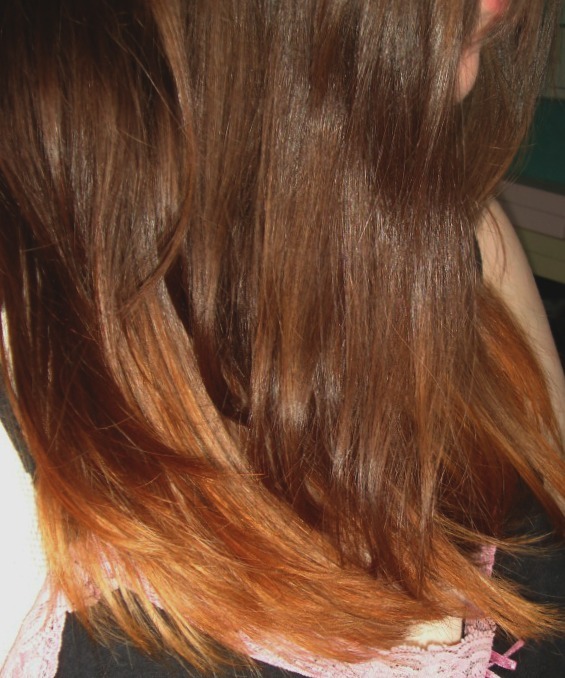 My hair was kind of orange, but definitely a little lighter. The restore is a purple toned conditioner product that you apply and leave for twenty minutes or so. It creates neutral tones and takes out brassy tones. It smells good, felt thick and luxurious and left my hair in lovely condition. But I'm not sure I want to tone it down more! It looks much more dramatic in flash photos than it really is, as you can see from the natural light picture. It's like my natural shade blends nicely into an auburn shade.. it's definitely grown on me the past few days - I was unsure to start with but my other half said it looks impressive and others have too. I like how it's not a major change to blonde -- I may or may not be tempted to go lighter in the future. For now though, I love my new ombre, it's different and is just wanted I needed to make my hair interesting again. Another thing I loved was that the condition of my hair was no different to before I used the stripper. It is so gentle and my ends do not feel damaed atall. I cannot reccommend the Scott Cornwall range enough if you are looking to make a colour change to your hair. Check it out here. Well done if you got to the end of this, it was a bit of a mammoth post! So nice. I like that it's not the traditional blonde. It's different and funky! Great pics ! Looks as though u spent hundreds of pounds with that salon look you got going on there gf ! Love SC products. Used the old formulation ColourB4 last year 3 times with good results and the new formulation Decolour is much easier to use. I have two packs waiting for when my daughter wants to strip her black hair. Thanks for sharing, you hair looks in great condition too. Did this damage your hair at all?..would using the colour restore on it's own work and take the orange tinge out your hair? I still dont get the difference between colour b4 hair dye remover and decolour stripper? Can you please explain the differences because both of their descriptions pretty much sound the same. Colour B4 removes hair dyes from your hair to reveal your natural hair colour underneath, unless a product with peroxide/bleach has been used, in which case it will take you back to that. A stripper with remove the dye molecules and your own natural hair pigment colour to, lightening it.